Modeling always requires abstraction and simplification. We need to arrive at a system for representing the components of a system, the laws of action that describe their evolution and interaction, and a way of aggregating the results of the representation of the components and their interactions. Simplifications are required in order to permit us to arrive at computationally feasible representations of the reality in question; but deciding which simplifications are legitimate is a deeply pragmatic and contextual question. 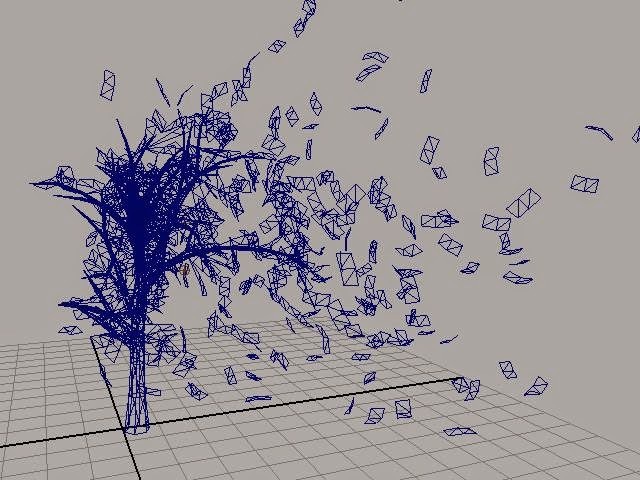 Ignoring air resistance is a reasonable simplification when we are modeling the trajectories of dense, massive projectiles through the atmosphere; it is wholly unreasonable if we are interested in modeling the fall of a leaf or a feather under the influence of gravity (link). Modeling the social world is particularly challenging for a number of reasons. Not all social actors are the same; actors interact with each other in ways that are difficult to represent formally; and actors change their propensities for behavior as a result of their interactions. They learn, adapt, and reconfigure; they acquire new preferences and new ways of weighing their circumstances; and they sometimes change the frames within which they deliberate and choose. Modeling the social world certainly requires the use of simplifying assumptions. There is no such thing as what we might call a Borges-class model — one that represents every feature of the terrain. This means that the scientist needs to balance realism, tractability, and empirical adequacy in arriving at a set of assumptions about the actor and the environment, both natural and social. These judgments are influenced by several factors, including the explanatory and theoretical goals of the analysis. Is the analysis intended to serve as an empirical representation of an actual domain of social action — the effects on habitat of the grazing strategies of a vast number of independent herders, say? Or is it intended to isolate the central tendency of a few key factors — short term cost-benefit analysis in a context of a limited horizon of environmental opportunities, say? If the goal of the simulation is to provide an empirically adequate reconstruction of the complex social situation, permitting adjustment of parameters in order to answer “what-if” questions, then it is reasonable to expect that the baseline model needs to be fairly detailed. We need to build in enough realism about the intentions and modes of reasoning of the actors, and we need a fair amount of detail concerning the natural, social, and policy environments in which they choose. 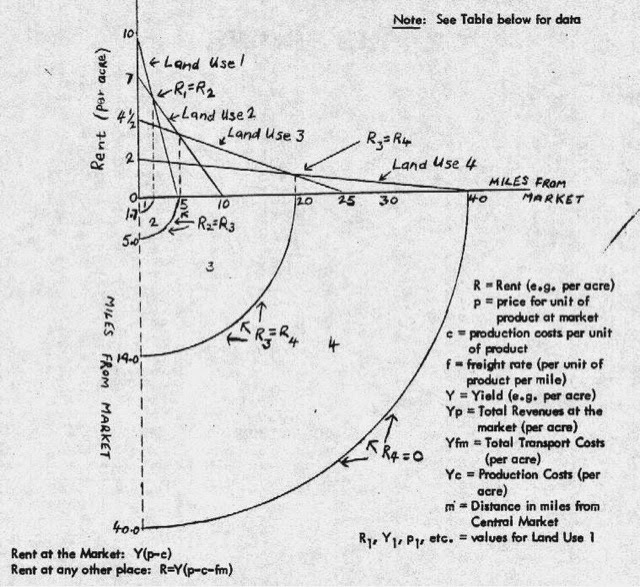 The discipline of economic geography provides good examples of both extremes of abstraction and realism of assumptions. At one extreme we have the work of von Thunen in his treatment of the Isolated State, producing a model of habitation, agriculture, and urbanization that reflects the economic rationality of the actors. 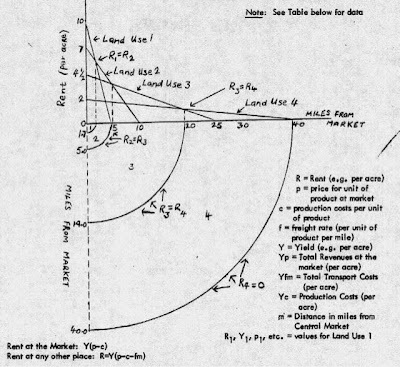 An interesting current illustration of the value of agent-based modeling in analysis and explanation of historical data is presented by Kenneth Sylvester, Daniel Brown, Susan Leonard, Emily Merchant, and Meghan Hutchins in “Exploring agent-level calculations of risk and return in relation to observed land-use changes in the US Great Plains, 1870-1940” (link). Their goal is to see whether it is possible to reproduce important features of land use in several Kansas counties by making specific assumptions about decision-making by the farmers, and specific information about the changing weather and policy circumstances within which choices were made. 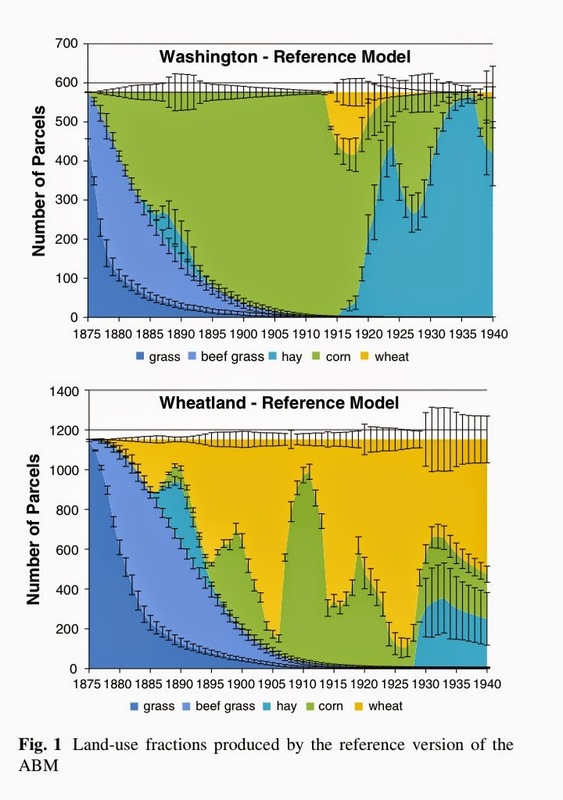 Here is a graph of the results of the Sylvester et al agent-based model, simulating the allocation of crop land across five different crops given empirical weather and rainfall data. Our base model, assuming profit maximization as the motive for land-use decision making, reproduced the historical record rather poorly in terms of both land use shares and farm size distributions in each township. We attribute the differences to deviations in decision making from profit-maximizing behavior. Each of the subsequent experiments illustrates how relatively simple changes in micro-level processes lead to different aggregate outcomes. With only minor adjustments to simple mechanisms, the pace, timing, and trajectories of land use can be dramatically altered. However, they argue that this lack of fit does not discredit the ABM approach, but rather disconfirms the behavioral assumption that farmers are simple maximizers of earning. They argue, as sociologists would likely agree, that “trajectories of land-use depended not just on economic returns, but other slow processes of change, demographic, cultural, and ecological feedbacks, which shaped the decisions of farmers before and long after the middle of the twentieth century.” And therefore it is necessary to provide more nuanced representations of actor intentionality if the model is to do a good job of reproducing the historical results and the medium-term behavior of the system. (Above I mentioned the whimsical idea of “Borges-class models” — the unrealizable ideal of a model that reproduces every aspect of the phenomena that it seeks to simulate. Here is the relevant quotation from Jorge Borges.